Computer HealthCare is the practice of keeping computers in a good state of repair. 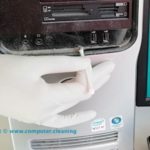 A computer containing accumulated dust and debris may not run properly. Dust and debris will accumulate as a result of air cooling. Any filters used to mitigate this need regular service and changes. 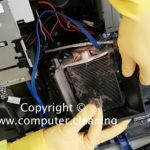 If the cooling system is not filtered then regular computer cleaning may prevent short circuits and overheat. 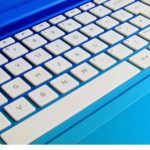 The crumbs, dust, and other particulates that fall between the keys and build up underneath are loosened by spraying pressurised air into the keyboard, then removed with a low-pressure vacuum cleaner. A plastic-cleaning agent applied to the surface of the keys with a cloth is used to remove the accumulation of oil and dirt from repeated contact with a user’s fingertips. If this is not sufficient for a more severely dirty keyboard, keys are physically removed for more focused individual cleaning, or for better access to the area beneath. Finally, the surface is wiped with a disinfectant. 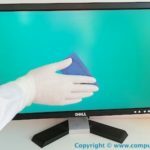 Fingerprints, water spots, and dust are removed from the screen with a cleaning wipe specialised for the screen type (CRT, LCD, etc.). A general plastic-cleaning agent is used on the outer casing, which requires a less gentle cleanser but may need more focused attention to unusual buildups of dust, grime, pen marks, etc. idiosyncratic to the user and environment. The top surface of the mouse is wiped with a plastic cleaner to remove the dirt that accumulates from contact with the hand, as on the keyboard. The bottom surface is also cleaned to ensure that it can slide freely. If it is a mechanical mouse, the trackball is taken out, not only to clean the ball itself but to scrape dirt from the runners that since the ball’s movement and can become jittery or stuck if impeded by grime. Internal components accumulate dust brought in by the airflow maintained by fans to keep the PC from overheating. A soft brush may remove loose dirt; the remainder is dislodged with compressed air and removed with a low-pressure vacuum. The case is wiped down by a cleaning agent. A pressurised blower or gas duster can remove dust that cannot be reached with a brush.